Anna Anderson and her brother Charlie. | Photo provided by John Anderson, of DeKalb. Anna Anderson is known to some as Jacob Haish's longtime housekeeper, someone who was close enough to Jacob and Sophia that she was given lifetime use of the mansion after their passing. To others, she's remembered as a sweet, hardworking aunt. I met with John Anderson, of DeKalb, and Jim Anderson, who currently resides in Utah. Anna was their great aunt. Anna was the sister of their grandfather, who was also named John Anderson. Anna's nephews remember her as a "quiet" woman. Although she was an immigrant, both John and Jim remember that she could speak English very well. "She had a funny voice," Jim recalls. "I remember her voice, it was a little bit on the deeper side." John said he recalls her being a "big boned" woman. "Well, all the family is big Swedes," Jim said with a laugh. Anna was born May 28, 1881 in Skane, Sweden, according to her obituary in the Daily Chronicle. She died Nov. 8, 1953. John said he believes it was Jacob's wife who hired Anna. "[Sophia Haish] told a friend she needed a housekeeper and she said 'I've got just the person -- my sister Anna,'" John said. "I'm not sure what [Anna] did before that." Anna Anderson (in front wearing a corsage on her chest) and some of her family members. | Photo provided by John Anderson, of DeKalb. "I don't know when Aunt Anna came over [from Sweden] but she must have been older because she was engaged to be married. She broke the engagement because she felt he drank too much. It is my understanding he was so despondent he was sick in bed for two months afterwards. Aunt Anna also worked for wealthy people and Mother said they were all so fond of her. After our father and mother got married though, she came to DeKalb and for a while was very unhappy. Dad's aunt got her a job with Jacob Haish (one of the inventors of barbed wire,) who had an elegant home on the corner of Third and Pine in DeKalb, Illinois. It was modeled after a German castle and he even had artists from Germany come over and paint his childhood scenes on the walls and domes of the ceilings. She was sort of a practical nurse as they were both getting up in age. He lived to be 99. The work was pretty hard because he was more or less bedridden the last few years, and at one time, she thought she couldn't take it any longer. Mrs. Haish had died probably 8 years previously. Anyhow, Mr. Haish's lawyer advised her not to leave because she would be well taken care of when he died -- which she was. The home and everything in it was hers as long as she lived. Anything she wanted, all she had to do was ask for it -- automobile, living expenses, trips, clothes, upkeep of the grounds, decorating, etc. I think Aunt Anna lived about 27 years after Mr. Haish died, so I guess it was worth it. After he died, she did marry but it didn't last long. She got a divorce and he was sent on his way (sort of a hushed up affair.) She didn't have to even go to court. Haish's lawyer was also the judge, so all she had to do was sign the papers, and it was all over." John explained what he recollected about Anna's divorce. "After Jacob died, she did get married and he just thought she was going to be full of money, because she lived in this big house and everything." John said. "That's all he wanted was the money. So she went to the lawyer and told him about it, and he had it annulled." Jim said they've never been able to even find a record of this marriage. 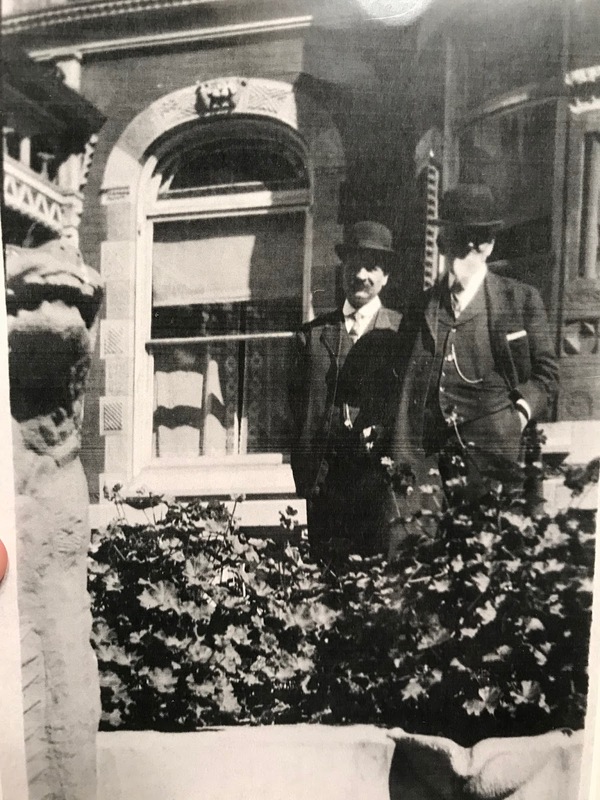 Anna's brother John Anderson (left) and Jacob Haish (right) pose for a photograph in front of the Haish mansion. The photograph was taken by Anna Anderson, "who was usually the one taking the photos," said John Anderson, the grandson of John in the photo. | Photo provided by John Anderson, of DeKalb. Jim and John have faint memories of visiting the Haish mansion once it belonged to their great aunt. Jim recalls seeing the third floor of the mansion, with a stage area for a band or orchestra. "There was also a side room with a barber chair," Jim said. "I just assumed he had his hair cut there." The Andersons would have family reunions at the Haish mansion in the summertime. Jim also once attended a Thanksgiving dinner that Anna hosted there. John was in California at the time, but Jim still remembers the dinner they had that night. "I remember [Anna's] pudding," Jim said. "My wife, I always give her a hard time, because I can't remember how [Anna] made it. I know it had brandy in it and it tasted really good. I can't remember if it was dates or fig. It was great!" John wonders if Mrs. Haish or Anna would have done the cooking for the household. "All I know is that [Jacob Haish] hired a housekeeper, and that just evolved into more work as [the Haishs] got older," John said. Jim recalled that the Ellwood family had a housekeeper that close friends with Anna. Her name was Emma, and she was a fellow Swedish immigrant. "They were very close," Jim said. John said Anna is remembered as a friendly person, up until she passed away in 1953, almost 30 years after Jacob Haish's death. "[Jim] has a good friend that was raised in that neighborhood," John said. "Aunt Anna would come up from the grocery store in her car, and when they'd see the car there, they'd go help her take the groceries in. She was always good for some cookies." Anna Anderson's obituary, as it appeared in the DeKalb Daily Chronicle.